Lookout Gang features a family of elk perched on the top of a grassy hill, forming the lookout patrol for the small nursing calves that are basking in the afternoon light. High in the Rocky Mountains, outside a tiny town called Cadomin, the elk are able to live peacefully without fear of the onslaught of tourists that their cousins in Jasper experience. Nestled quietly in the grass at the base of the hill, Erin watched these elk for a precious few minutes before leaving them in peace. 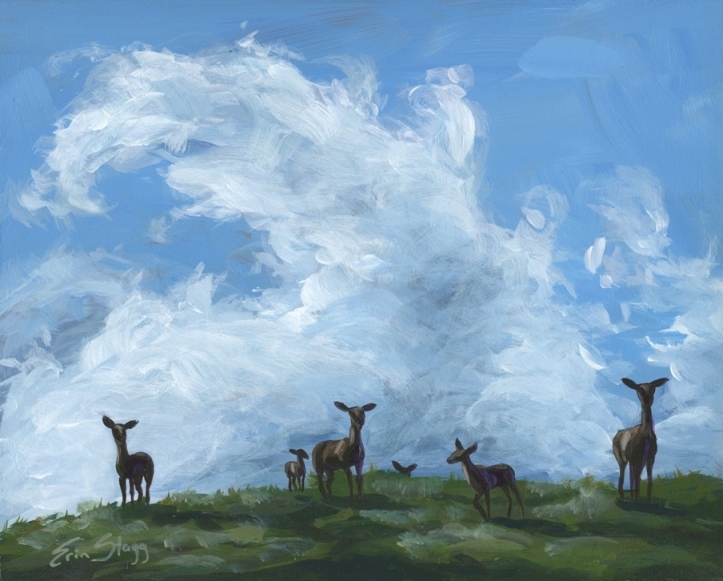 The clouds spired behind the elk, a reminder of their majesty and connection to the raw elements of nature. The colours are dramatic and tranquil, a reflection of the tender tension of the moment.